Vaccine Science Revisited, or at least the research process that led to its creation, has been about half a century in the making. 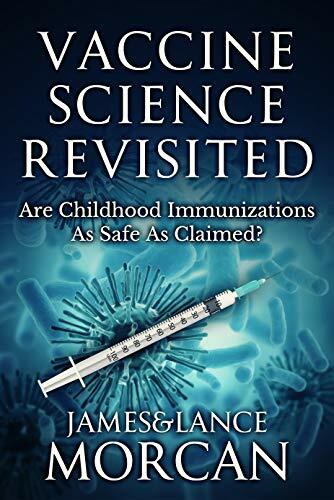 We reveal this to readers in the introduction of our new release book Vaccine Science Revisited: Are Childhood Immunizations As Safe As Claimed? – by James and Lance Morcan. (That’s us)! As the following shows, our investigation into vaccines, child vaccines in particular, began by mere happenstance. The older one of us (Lance) started actively researching child vaccines as a young newspaper and broadcasting journalist in the late 1960s and early 1970s. This entailed visiting hospitals and medical clinics in New Zealand and Australia, and interviewing doctors and nurses as well as parents. Scientific research into vaccines was fairly new back then and much has changed since those early times. What’s interesting is the immunization schedule of recommended vaccines was considerably less then than the amount of vaccines that are recommended, or in some cases are mandatory, today. Over the decades, we have monitored from afar the sciences that relate to vaccines. A sometimes overwhelming task that included reading various books by scientists, following news stories written by other investigative journalists on vaccines, and talking to laboratory technicians, doctors and nurses about the immunization process. In more recent years we made several attempts to begin writing this book. However, we always found the research required was simply too exhaustive and kept putting it aside to work on other (less intellectually demanding) book and film projects. In 2015, we published a book called Medical Industrial Complex, which aimed to expose the financial corruption and conflicts of interest that exist in modern medicine. Doing research for that particular book saw us not only interviewing doctors, nurses and other medical professionals once more, but also collaborating with a veteran pharmacist. It opened our eyes to some alarming practices within modern medicine that we hadn’t previously considered. Cozy relationships between supposedly independent and unbiased divisions of the healthcare sector being one of those, and the shutting down of potentially worthy medical debates because of financial interests, academic rigidity or even political correctness being another. Although we briefly touched on vaccines in that book, it was admittedly more of a cursory overview. We still did not feel sufficiently knowledgeable or well-researched to accurately assess the science behind the modern immunization process. Nor had we, at that stage, a clear picture of the dramatic and often torturous early history of vaccinations. A history which makes for compelling reading and which we address in the first few chapters of this book. Around the same time we started a global discussion group called Underground Knowledge on Goodreads – the popular, Amazon-owned, social media site for book readers. It soon became (and continues to be) an excellent forum for public debate on vaccinations and medicine in general, attracting concerned parents and social activists as well as doctors, scientists and other medical professionals with firsthand experience in either administering vaccines or working with them in laboratories. We ran a group poll asking members, Do you believe child immunizations/vaccines are for the most part extremely safe as per official statements from mainstream medicine and Big Pharma? The poll received 501 total votes of which 281 (56.1%) voted Yes. However, 220 voted either No or Unsure. The numbers of poll respondents in doubt, combined with certain comments made by medical practitioners, finally inspired us enough to attempt to drill down to deeper levels of medical research papers, do the hard yards and write the book you are reading now. At first, we felt more like fence-sitters as we were simply observing all sides and listening to the various arguments. We also knew we wouldn’t be able to make up our own minds simply by reading other people’s statements. We had to attain a stronger comprehension of the medical sciences at hand to gain an educated and informed understanding of vaccines. A lifetime’s interest in health combined with our previous investigations into the medical sector, or sectors, had taught us that nature often finds ways to take care of itself, the human body included. We realized early on in our research there was a real concern about introducing the body to toxins it has never had to deal with before. Toxins that enter the body unnaturally and bypass our natural defense system. It became apparent to us the body reacts differently to these toxins depending on the route of entry. This adds a further complexity to the whole vaccination issue. A complexity that would present challenges for us when sifting through study designs while gathering appropriate information on vaccine ingredients. Since these vaccines are approved and deemed safe, we had to consider that perhaps the amount of toxins (in vaccines) are small enough that our body can accommodate and process them without a problem. After all, it is a part of our body armor’s design to filter out and eliminate toxins. This works well for healthy individuals, but we soon realized that, unfortunately, in today’s society there are countless children with weakened immune systems whose protective armor is not as strong. Although these children are in minority, we feel strongly they should not be tossed to the wayside and ignored. If vaccines really are unsafe for children with permanently weakened immune systems, they could also be unsafe or risky for the majority of children whenever their usually healthy immune systems are temporarily in a weakened condition for whatever reason. On that note, after we started reading the package inserts for each vaccine, we realized that all the inserts come with warnings on who should not be given vaccines. Check these package inserts out. They make for very interesting reading. After talking to many parents who have taken their children in for immunizations, it appears the information given to them about the shots is limited to which diseases the shots are for. Other than that, the parents are essentially left in the dark. When we approached doctors and nurses about this issue, many said they don’t have time to read all the package inserts, relying instead on what they are being told by “the experts” supplying the product. This motivated us to include them (medical professionals) in our long list of people this book is written for as we realized they often have little background knowledge on vaccine science. Which meant we had to make it sciencey enough to be taken seriously by them. We were under no illusions doctors, nurses, surgeons and other medical professionals would require much convincing because many we approached indicated they, and they alone, had science on their side. We reached this inescapable conclusion because they told us to “believe in the science” or “just read the medical journals.” In fact, we lost count how many of these professionals recited those phrases, oftentimes verbatim! Unfortunately, such comments usually came without any further explanation. It was as if these medical professionals thought those comments spoke for themselves as proof that vaccines are always completely safe and beneficial – and should never be questioned, apparently. It’s an unfortunate truth that modern science, like mainstream medicine, has been shown to be corrupt at times, or unconsciously biased at other times, and is often fallible. Make no mistake, we greatly respect scientific and mainstream medical journals as evidenced by the fact that about 90% of this book is simply references to, or reports and reviews of, official medical papers prepared by scientists. However, our caveat is that the facts and observations presented in such documents must be unbiased and untainted by academic dogma, pursuit of fame and profit, or any of the other failings that jeopardize medical research. We are aware some of our findings will upset those who are for vaccines, and some definitely won’t be popular with those against them. It wasn’t our goal to prove either side right or wrong, but to clarify where their arguments originate from and to revisit those origins, leaving the science to do the talking. We honestly had no idea where our research and reviews of medical papers would take us, and we were ready to accept the facts as long as they were appropriately presented. Little did we know how difficult it would be to source scientific and medical research that could be trusted as containing untainted or unbiased data. We soon found ourselves buried in research and began questioning our ability to tackle this monster of a subject. Conservatively, we would have read or at least skimmed more than a thousand research documents and papers. It was so overwhelming we were forced to rethink our strategy. We realized we needed to be pickier about the papers we chose to investigate, and so we did exactly that. We also brought together a team of medical advisors, including a doctor, lab scientists and other healthcare practitioners, who, between them, helped us develop the right approach to researching this complex field. This turned out to the best decision we made with this book. Our search through the research paper pile no longer seemed impossible as we finally had clear guidelines to work to. And so we started focusing on such things as who the authors of the studies were, where the studies were performed, how large the population sample was, who was included in the study, and the design of each study. It took us a while, but we were able to discard most studies after developing a list of qualifying criteria studies needed to pass if they were to be considered. Being able to work with a team of people who know how to read research papers, and bounce questions off them, was like a breath of fresh air. One good piece of advice we received from our medical advisory team was that after we found any research papers that met the qualifying criteria, we couldn’t just read the abstract or the conclusion. This, our experts informed us, was the problem for many health professionals. They simply don’t have the time to read the research, so they make do with the abstract or sometimes just the study’s conclusion. This forced us to read through entire research papers. Throughout our epic dive into the world of research papers, we realized that when it came to researching vaccines and their ingredients, many of them do not have adequate research data available. In order to find out the impact these ingredients or contaminants have, we found ourselves frequently forced to lean on research unrelated to vaccines or lean on research with a bias to fit either the hypothesis or the funding entity’s interest. It was at times very difficult, sometimes even impossible, to find articles by independent researchers accepted by the mainstream scientific community. Our feelings were supported by others in the scientific field as well. Another important point regarding research papers is the fact that it is very difficult for people in general, but especially those outside the scientific community, to know which sets of data are reliable. It is very concerning for us to read such an article in a prestigious, peer-reviewed, medical journal like The Lancet. Horton’s concern doesn’t stop there. His concern isn’t just aimed at the researchers, either. He feels journal editors can be just as shady in their actions, and there is an “unhealthy competition” taking place in trying to get papers published in the more prominent journals. It seems it isn’t just the researchers and journal editors who are desperate for favorable research. Universities are also seeking “money and talent”. In writing this book, we tried to be as diverse in our research as possible so as not to bias the reader. That said, we do of course have our own thoughts on vaccines, which are occasionally reflected in (fairly brief) commentaries scattered throughout the book. These are not meant to bias the facts presented, merely to share with you our thoughts. Please note the word Revisited in this book’s main title Vaccine Science Revisited. It refers to a new inspection of what the science actually says about vaccines and vaccinations. We are aware many members of the general public and, especially, the scientific community believe any debate over vaccine effectiveness, or how safe vaccines are, should have ended long ago, and that “science has already conclusively spoken.” We beg to differ, and we believe you will, too, once you read this book and consider the almost infinite number of murky, gray areas exposed by the vast amount of research out there. Too much has been assumed and misunderstood – on all sides. It’s definitely time for society to revisit the subject of vaccines and vaccine safety, especially where our children are concerned, and open up the scientific debate once more. Keep in mind, however, the debate we are primarily focused on is not whether or not we should vaccinate/immunize our children. Rather, as this book’s subtitle suggests, we are focused on whether childhood vaccines are as safe as claimed. For it is, after all, possible to be extremely pro-vaccines yet still wonder if they can and should be made safer. Likewise, it is also possible to be very pro science and anti-pseudoscience yet still question vaccine safety claims or else demand more effective safety protocols. So, the aforementioned doctors and other medical professionals who dismissively replied to all our questions with “Believe in the science” or “Just read the medical journals” will be pleased to know we have done exactly that – and only that. We trust you’ll appreciate how this book avoids all rumor, conjecture, conspiracy theories and anecdotal evidence, and steadfastly focuses on what the latest medical and scientific research actually says about vaccines. Even if you are anti-vaccines, or else highly-skeptical of their safety, remember that if any of the most controversial theories are true then it must be possible for science to prove it. Eventually, any harmful vaccine ingredients will be proven to be just that. That’s why we have excluded all theories and focused on facts contained in the best research data available. Beyond all the controversy, naivety, paranoia, academic rigidity and Pollyannaish trust in governments and multinational pharmaceutical corporations, what does the most reliable and unbiased science actually reveal about vaccines? Read on to find out. And no matter your level of education or experience – whether you are a doctor, layman, scientist, nurse, med student or new parent – be prepared to be surprised by much of the medical research findings. Underground Knowledge group membership tops 10,500 on Goodreads!